Saying "We Eloped!" has got to be one of the most romantic things ever! Planning a secret exchange of vows and getting married, just the two of you, is like, EVERYTHING! A wedding can be so many things. 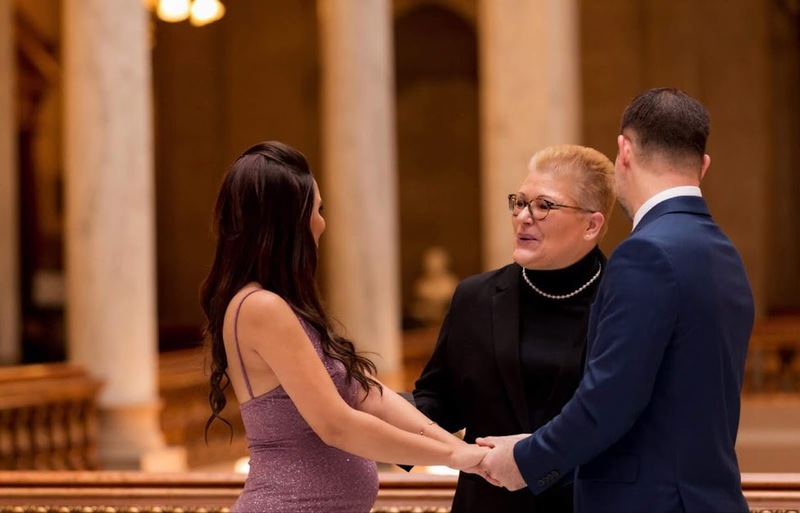 It can be an important celebration of a change of life and commitment for you and your loved ones, it can be a simple legal agreement, and it can be a literal religious experience in a church. Sometimes it's all three at once. Eloping is between the two of you - It still involves a legal agreement, it might be a religious or spiritual experience and it is still very much a celebration of the two of you and the love you share - It's just a lot more intimate. 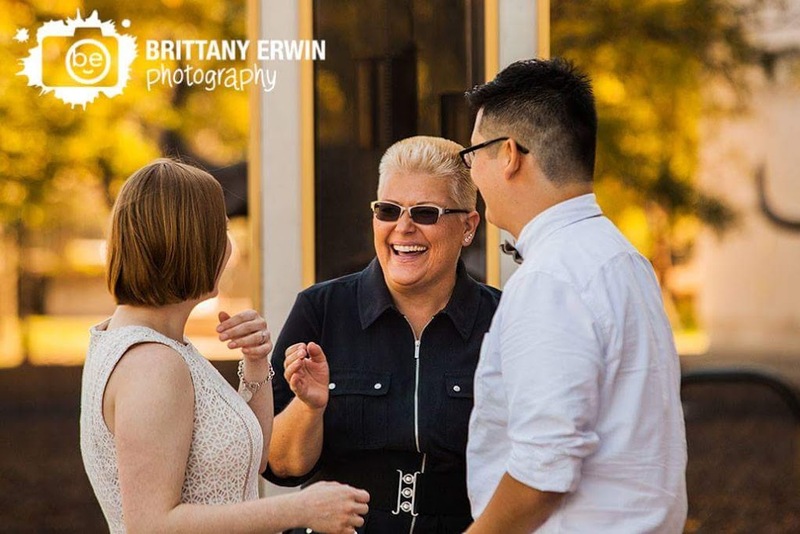 As a wedding officiant, meeting with just two people and marrying them is an absolutely exhilarating experience. Nobody is watching, there are no expectations. It's intimate and honest. It's an incredibly empowering experience to realize the power the two of you have together to create something as incredible and as special as your marriage. As your wedding officiant, I have services for any type of wedding you might be planning. This page is dedicated to elopements and small weddings. This page is about my formal wedding officiant services. I also have another options for couples just looking to be legally married. You can check out my $50 Quickie Civil Ceremony Options Here. It gets the job done! Is it legal? Can we elope, just the two of us with no witnesses? Yes! In Indiana no witnesses are required to get married. You just need a wedding officiant. 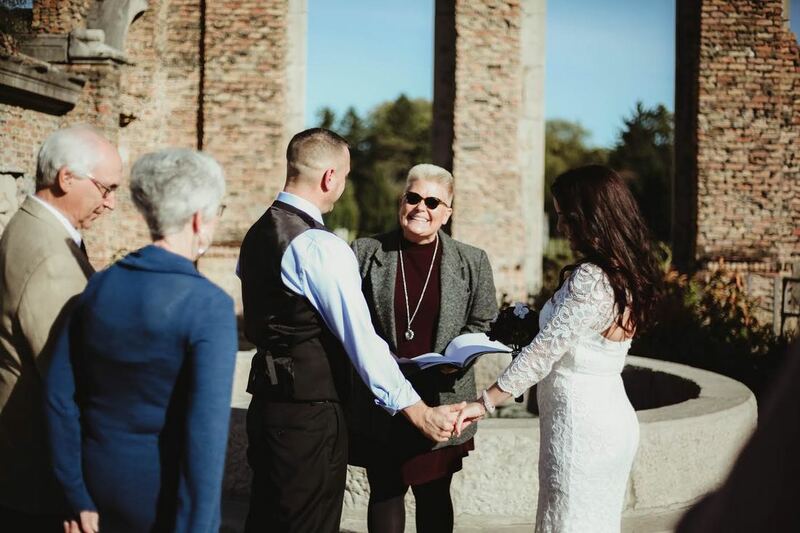 A wedding officiant is anyone who is legally able to sign your marriage license with you. See more about the legalities here. Many couples are hiring an AWESOME photographer and orchestrating the perfect wedding day. From the dress and the suit to the make-up artist. You can get ready at home or rent a room or a suite in a downtown hotel. You could even rent out a small Inn like The Brick Street Inn in Zionsville. You can do all the memorable things you would do at a big wedding, just on a smaller scale. Some couples will have a small, intimate wedding with family and then celebrate later with their friends. Either at their favorite bar in the the backyard of their new home home because they chose to spend the money on a house instead of a wedding. Where Can I Elope in Indy? 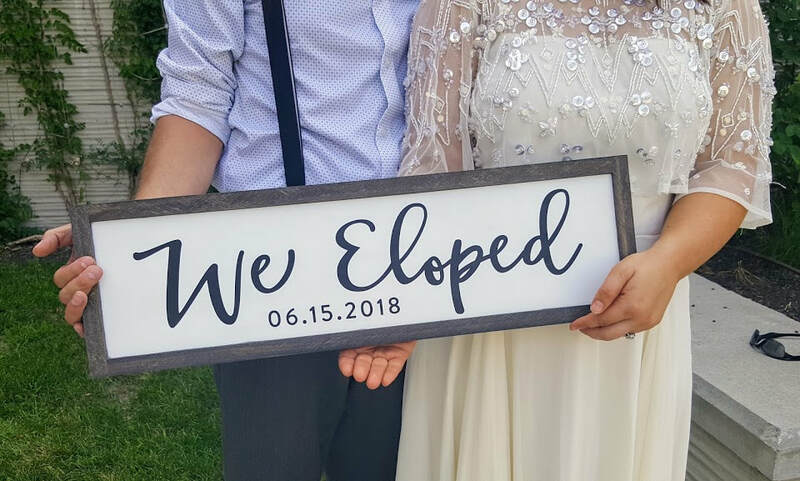 You can elope anywhere you choose. Pick the perfect place for you. I'm happy to travel anywhere in Indiana. I recently married a couple on Christmas morning on the deck of their rented cabin as the sun rose over Lake Monroe in Brown County. (They were in their pajamas!) Christmas night I traveled out to Bainbridge to marry a couple on their back deck while their friends warmed themselves by a bonfire. Some weeks I'll find myself marrying a couple in a Friday afternoon in their living room before their kids get home from school. As I get there, the makeup artist is leaving and their photographer is busy taking pictures of the dress, the cake and the champagne glasses. Other weeks I'm out in a nature preserve. Tonight, the weather was bad so the elopement was moved inside and 40 people were able to gather in the groom's grandparents home to watch them get married. I recommend once you hire a great photographer to ask them what they think. They can give you recommendations of locations for great photos that suit your personality. A rooftop or a waterfall or and art installation. 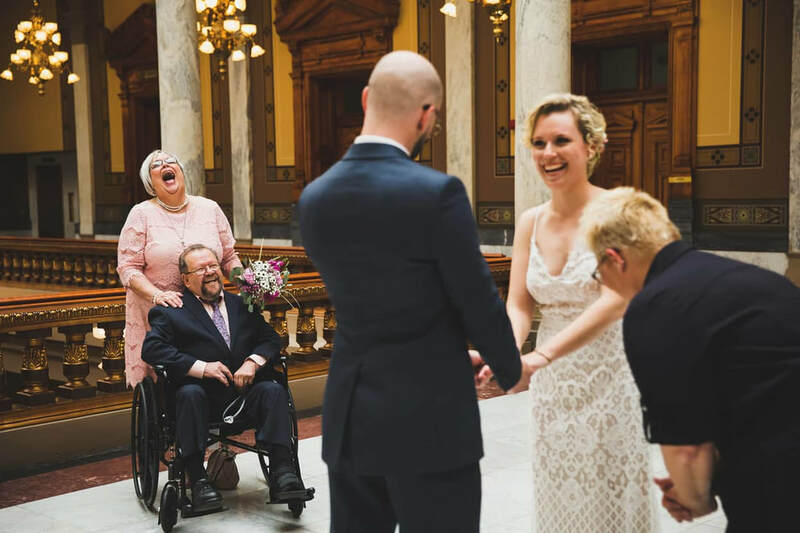 You can find the perfect place that suits you and anyone you might want at your wedding, like a place for your kids and dogs to run or a wheelchair accessible place for your grandparents. The perfect sunrise or sunset. My favorite spot for an elopement is anywhere you choose. I want you to feel comfortable and be happy! Maybe you want to elope in the same place you had your first date or where you got engaged. Tonight's wedding was in front of the same Christmas tree where they got engaged! Some people had their first date walking on the canal and then they got engaged there. It only makes sense to have the perfect elopement there. Sometimes, the only place you ever dreamed of getting married was on your grandparents farm. Some couples have gotten married in a cemetery near the graves of loved ones because that was meaningful to them. When it comes to elopents, the sky's the limit! One thing I want everyone to know is, you can get married anywhere and then you can also take pictures anywhere. Just because you think a spot is beautiful, it doesn't necessarily mean that it's a perfect spot to exchange vows. Waterfalls are pretty but you can't hear anything else when you are standing near one. The canal is pretty but there are people walking everyone around you. Hire a photographer to walk with you and take pictures in those places but choose some place more dependable to get married - rain or shine. What is involved with eloping? You have to get a marriage license from the county clerk. You have to get married and complete the marriage license with a wedding officiant. How you get married is when you choose to elope, have a small wedding, a simple civil ceremony or a full formal wedding ceremony. You have to return the marriage license. I'm a wedding officiant, I'm the person that marries you. I help you choose and perform a wedding ceremony and complete the marriage license with you. When you decide when and where you want to get married, you make an appointment with me and I will come and marry you. Brittany Erwin - Brittany Erwin Photography - Speedway, Indianapolis. Summer Galyen - Summerly Photography - Indianapolis. Autumn Howell - Autumn Howell Photography. - Kokomo. Casey Rucinski - Casey and Her Camera - Indianapolis. Photo by a Family Friend, Location, Holliday Park, Indianapolis. How much does eloping cost? Traveling to anywhere within an hours drive of my home in Fishers. Basically, put the location address in your gps and put Fishers, 46037 as the start point and click on start. If the regular travel time is 60 minutes or less. I will travel there at no extra charge. Additional fees are based on the distance and the day and time of your wedding. One hour to get married. It really only takes about 20 minutes to sign your marriage license and perform a wedding ceremony. I schedule a full hour "Just in case." Maybe you are running late or there are unforeseen circumstances. I plan for that so I can give every couple and their wedding my full attention. No rush! Ceremony Consultation. I have pages and pages of ceremony options for you to choose a pre-written wedding ceremony. If can choose a pre-written ceremony or create your own. I'm happy to sit down with you and discuss your ceremony and answer any questions you might have. Can we choose our own ceremony? ​Elopement Ceremony Scripts. You can choose from romantic, christian or a civil ceremony. Wedding Ceremony Scripts. For when your elopement turns in to a small wedding. My entire wedding ceremony website. 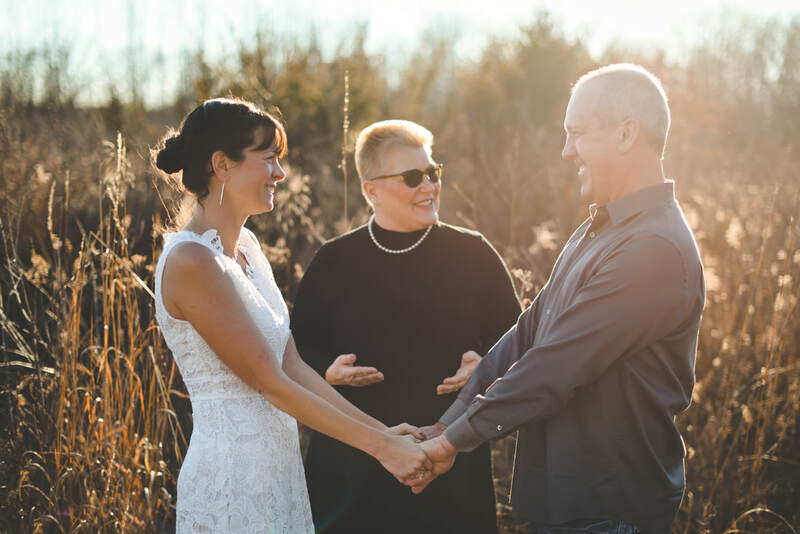 I've gathered countless options for readings, vows, ring exchanges and unity ceremonies for you to choose from and customize. How far ahead do we have to schedule? You can usually call and get married in the same day or you can schedule up to a year in advance. It's not uncommon for me to receive a call in the morning to meet a couple later in the day. I'm available every day. You can check my availability and schedule directly online here. Yes. Payment in full is due to book your date and time. I have a very fair payment and refund policy that you can view here. You used to offer budget wedding options with locations. Why did you stop? I found that many couples were taking advantage of the "free venue" involved in the budget elopement and planning small weddings. While my job is essentially the same - signing your marriage license and performing a ceremony - the logistics of accommodating 10, 20 or 30 people in an outdoor public space dramatically changes. If it rains, 2 people are fairly easy to relocate, more people can be much more difficult. 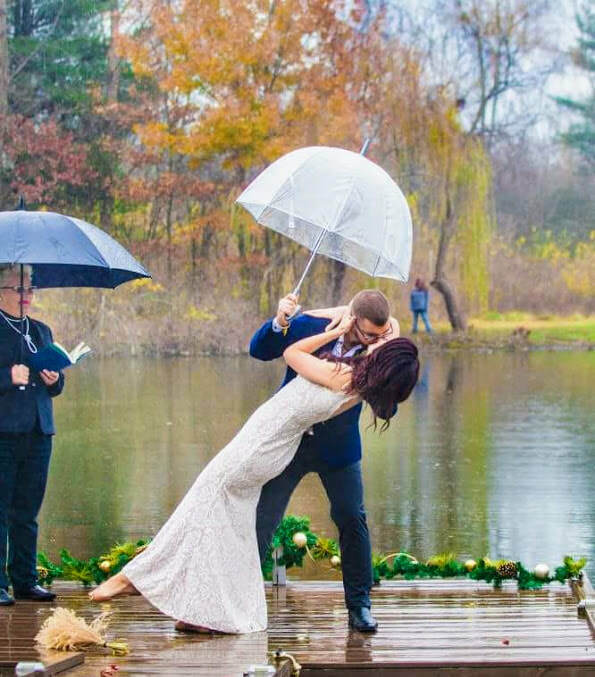 Do you really want to get married in the rain and/or wind? I also found that often there were other officiants that had booked weddings at the same time in the same space. It's your wedding. Do you really want to fight for a location or share it? I've written an entire blog post on the subject on using free outdoor public spaces to elope here. I care about your wedding. I care about everyone being adequately accommodated. I want you pass my experiences on to you to allow you to better decide the best place for you to get married. After the weather we had in 2018, I don't recommend anyone plan an outdoor wedding ceremony unless they have a firm backup plan. By eliminating the budget elopement I'm able to properly schedule plenty of time to accommodate last minute changes, for whatever reason. If you want to get married on the canal but your backup plan is your home 30 miles away, I can do that. If your elopement for 2 turns into 20, or 75, no problem! It's truly peace of mind for everyone. Please contact me! Call or Text (317)403-7379 or email.